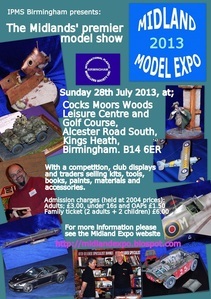 Once again Birmingham IPMS did not disappoint with yet another successful show! In attendance was myself , Adrian, Martin Cook, Mike Skelding and our newest member Marc Hannah and as you can see in the pics we where sporting the new club tops for all to see! For those present they will be aware the day got off to a damp start and they will all know what I mean by that...lets just say thank god those present have a WARPED sence of humour.....and no it was not me this time with another exploding flask....anyway that's too much info already! The stand consisted of two 6ft tables and goes without saying things where somewhat cosy and as a result Martin is booked in to have new knee and hip joints sometime soon for constantly having to stand up to let the rest of us folk out. On a positive note it did our abs good with all the sucking in to squeeze out! Pleased to say our display once again in my opinion was great with a true variety of subjects for all tastes for which folks did stop to have a chat....especially to tell Ade there was a Lancaster with spinning props the other side of the hall....sorry Ade could not resist! As for the competitions well once again Mike came first in class for his figure (sorry mike forgot the name so will need to edit later) and Martin got a well deserved second for his Roman Boat...as for me....well enough said! Oh and Marc finally was bankrupted by the red cross stand directly behind us and all he won was the small dinky plane pictured....his face was a picture by the way! All in all we had a great day with plenty of banter and catching up with many familiar faces. The downside of the venue was the lighting as the yellow bulbs played havoc with our cameras but that certainly did not spoil our fab day and goes without saying that we cant wait till next year! Thanks once again to IPMS Birmingham for a great show....oh and parking attendant!